Živković Samardžić has been among the select few firms ranked in all practice areas covered in Serbia by The Legal 500 Europe 2017, while the directory recognized Marko Trišić, Živković Samardžić Dispute Resolution Senior Associate as the ‘next generation lawyer’. 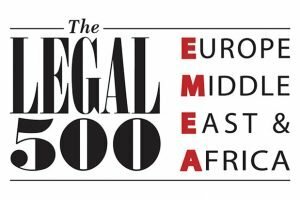 With a comprehensive research programme revised and updated annually to bring the most up-to-date vision of the global legal market, The Legal 500 has been analyzing the capabilities of law firms across the world for 28 years. Research, assessing the strengths of law firms in over 100 jurisdictions, is based on feedback from clients, submissions from law firms and interviews with leading lawyers. In 2017, with the inclusion of Dispute resolution and Employment practice areas, the coverage of the Serbian legal market has become more extensive. Živković Samardžić has been ranked in all practice areas covered in Serbia: Banking and finance, Commercial, corporate and M&A, Competition, Dispute resolution, Employment, Intellectual property and Real estate and construction. The firm has been ranked in Tier 1 for its Dispute resolution work, Tier 2 for Competition, Tier 3 for Banking and finance, Employment, Intellectual property and Real estate and construction, and is praised for being ‘exceptional’, ‘extremely service-oriented, motivated and efficient’ and for achieving ‘excellent results’. Marko Trišić, Živković Samardžić Senior Associate, who has been recognized as the ‘next generation lawyer’, graduated at the University of Belgrade Faculty of Law in 2010 and is with the firm since 2012. Marko is a Deputy Head of Živković Samardžić’s Dispute Resolution practice.